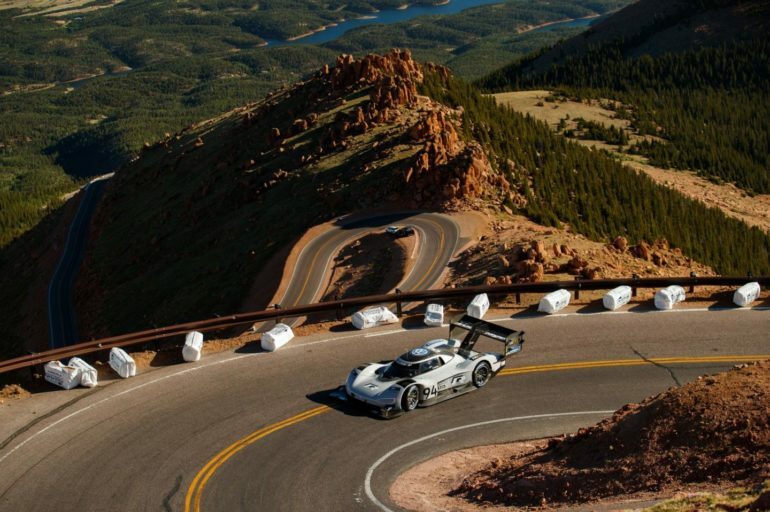 An electric car has smashed the lap record at the world-famous Pikes Peak hillclimb, beating the fastest time recorded by a fossil-fuelled machine by more than 15 seconds. The battery-powered Volkswagen I.D.R, driven by two-time Le Mans winner Romain Dumas, was officially only expected to set the record for an electric vehicle, which prior to the event stood at 9m 07.222s. Early testing, however, indicated that the overall lap record could be broken in the ‘race to the clouds’, which has been dominated by electric cars in recent years. Damp weather conditions and an incident involving another competitor failed to prevent the record being broken. Dumas’ completed the 19.99-kilometre course in 7m 57.148s, beating fellow Frenchman Sébastien Loeb’s 2013 benchmark of 8m13.878s set in a 3.2-litre twin-turbo Peugeot 208. The VW I.D.R is the latest electric vehicle to revolutionise motorsport. It was developed and built in just 250 days, and designed to be as light as possible whilst maximising downforce in the thin air at the top of the mountain. The 1,100kg machine develops 500kW, which is equivalent to around 670 horsepower, and can be fully charged in just 20 minutes, in accordance with the event regulations.